Our vintage-inspired Amish Arlington French Dining Chair is sure to take mealtime to new heights. Its graceful curves will be an outstanding addition to any space. At DutchCrafters, we offer a wide range of options so you are able to order exactly what you want. You can choose to order in a dining chair style or in a counter or bar height. These French reproduction chairs are shown in beautiful rustic cherry wood with our popular OCS 108 stain to bring out the beautiful grain of cherry wood furniture. 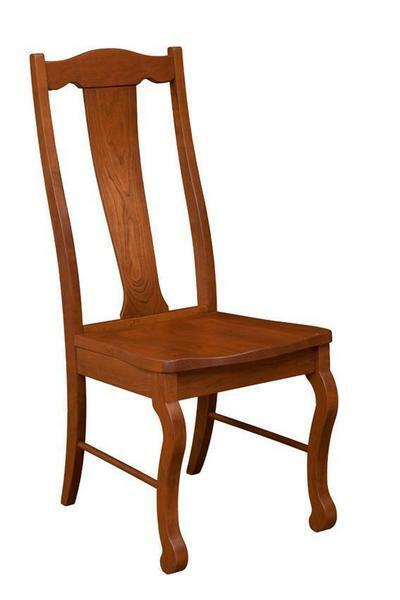 Be sure to take a look at our Arlington Slat Back Chair for another gorgeous version of this great piece. Pair either selection with our Arlington Pedestal Table for a memorable look. Order samples before or after you order to match up to existing furniture. Call 1-866-272-6773 for assistance with receiving samples, ordering, or questions on our reproduction of antique French dining chairs.